HOLMDEL – Andy Williams came to the Garden State Monday night . . . and ten thousand admirers applauded the idea! a full gamut of emotions. The reminiscence, sadness, dreaminess, and romance brought on by such favorites as More, Hawaiian Love Song, Moon River, Honey, and the Days of Wine and Roses was converted to enthusiastic rhythm clapping when Andy broke out with In The Summertime. Also included in Andy’s repertoire, spiced with intervals of light and amusing banter, were Somewhere, Simon and Garfunkel’s Scarborough Fair, and Oh, My Beautiful Balloon. For the latter, the lighting engineers at the Art Center also deserved a round of applause. Appearing with Mr. Williams at the Center are the Osmond Brothers and Peter Nero. 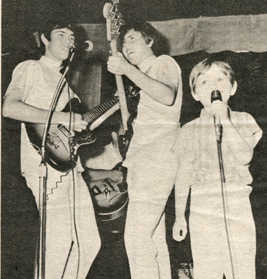 Billed as the five brothers (there are nine youngsters in the family) the act is literally broken up with sixth brother, four year old Jimmy, who enchanted a willing audience with I Dig Rock and Roll Music. The brothers first five, and later six, sang, danced, and played a variety of musical instruments, much to the delight of the listeners. The rapport between them and Andy Williams, on whose program they first starred seven years ago, is evident and adds to the evening. Suave, debonair Peter Nero captivated both classical and popular music lovers with his exhaustive piano renditions, touching on Gershwin, Rogers and Hammerstein, and Simon and Garfunkel, among others. Sounds of Silence was particularly effective; however, Mr. Nero’s arrangement of the score from the Sound of Music received overwhelming applause and appreciation. Henry Lewis debuted as the conductor of the New Jersey Symphony, and introduced both the program and the second half, following intermission as well as accompanying Mr. Williams and the Osmonds, and providing background for Mr. Nero. Prior to coming to New Jersey, Mr. Lewis has led performances of Verdi operas with the Vancouver Opera, British Columbia, the American Opera Society, the Chicago Symphony, and the San Francisco Opera Company. He has received world wide acclaim for his vigorous sweeping conducting and his topnotch concert.